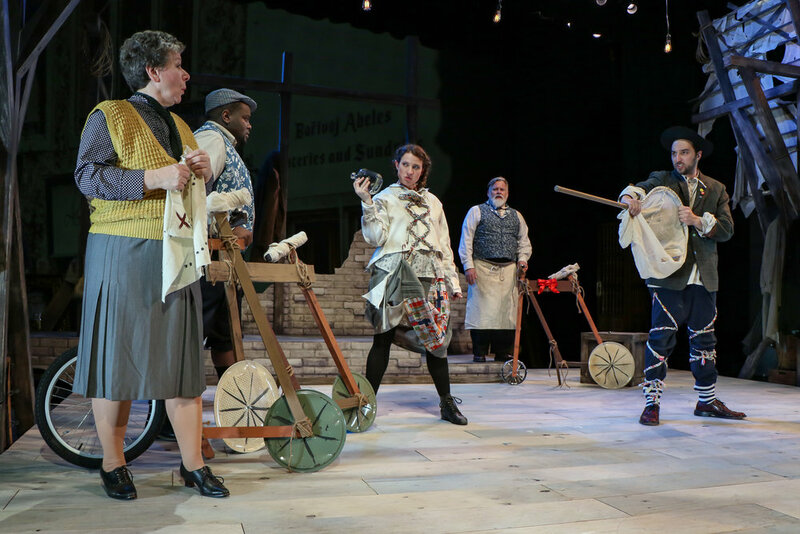 Two lunatics (Nick Narcisi, right, Maggie Marks, center) get ready to apprehend and banish cycle owners (from left, Leslie Fitzwater, Donnie Williams and Joel Kopischke) in a scene from “The Last Cyclist,” presented by the Cardinal Stritch University Performing Arts Department. Presented by the Cardinal Stritch University Performing Arts Department, the show is based on an original cabaret written by Karel Svenk in 1944. Svenk was among the Jewish political and social elite imprisoned in the Terezin ghetto by the Nazis. In order to convince the Red Cross that they were being humanely treated, the captives were allowed to create and present concerts, cabarets and operas -- to put on a happy face for the outside world. In fact, many in the ghetto were starving, suffering from illnesses and overcrowding, and were eventually sent off to gas chambers and crematoria. It is a somber backdrop for the play, directed by Mark Boergers, and reconstructed and reimagined by Naomi Patz. Svenk was sent to Auschwitz months after the play was performed in rehearsals, and the original script was never found. However, in 1961, Jana Sedova, the only member of the troupe believed to have survived, recorded Svenk’s play from memory. Patz based “The Last Cyclist” on the recollections of Sedova. Mrs. Manickova (Leslie Fitzwater) testifies at a trial conducted by the lunatics (Nick Narcisi and Maggie Marks. Before “The Last Cyclist” begins, we see Svenk (Joel Kopischke) preparing the “stage” for the night’s rehearsal. The large crates he moves about in the warehouse-like, makeshift theater contain costumes and props for the performers. As the cast arrives, they settle in and wistfully recount what life was once like for them. Elena (Marcee Doherty-Elst) complains about having to share her bed with two-other women in cramped quarters. Others talk about the meager rations, the crowded conditions, their ill health, how they once led comfortable lives. Svenk leads them through a series of warm-ups before the show is rehearsed, as he presumably would with any other troupe. Then he reminds them that his comedy offers them the chance to forget about their hunger, their itching from lice and a whole host of other discomforts and that “the train to nowhere should be nowhere in your thoughts tonight.” And, he tells them, he wants them to make the audience forget also. Rat (Randall T. Anderson) presides over the courtroom trial of Abeles (Joel Kopischke). It is a not-too-subtle parallel to what is happening in the lives of the cast – there is a mock trial which blames cyclists even for the cold weather, there is banishment to Horror Island (some think they are actually going to a special place for cyclists). There is The Opportunist (Monty Kane) who sells life insurance to the unsuspecting and frames his neighbors. The humor is dark in “The Last Cyclist,” knowing what the actors in Svenk’s play were experiencing. The absurdity, the play on words, the occasional slapstick are all viewed through the desperate eyes of the actors. This cast of “The Last Cyclist” put their all into Svenk’s little show – to consume themselves in the comedy and silliness so that the horror of their situation would have no place. Their pluck left me feeling their courage, strength and never-wavering hope. I especially enjoyed Kopischke’s Svenk, the writer and director who becomes the unassuming Abeles in his play. There is a sturdiness, yet gentleness, about him that endears him to his cast and to the characters in his play. Besides those mentioned, the cast of “The Last Cyclist” included Laura Ellingen, Leslie Fitzwater, Maggie Marks, Amanda Richards and Donnie Williams. Set design and technical director Greg Kaye and costume designer Kristina Van Slyke have bathed the stage in neutral tones and minimal props. Yet, the performances were so lively they seemed to bring color to the set.